Krajina (pronounced [krâjina]) is a Slavic toponym, meaning 'frontier' or 'march'. The term is related with kraj or krai, originally meaning "edge" and today denoting a region or province, usually distant from the metropole. The Serbo-Croatian word krajina derives from Proto-Slavic *krajina, derived from *krajь, meaning "edge", related to *krojiti, "to cut"; the original meaning of krajina thus seems to have been "place at an edge, fringe, borderland", as reflected in the meanings of Church Slavonic краина, kraina, and Old East Slavic окраина, okraina. In some South Slavic languages, including Serbo-Croatian and Slovene, the word krajina or its cognate still refers primarily to a border, fringe, or borderland of a country (sometimes with an established military defense), and secondarily to a region, area, or landscape. The word kraj can today mean an end or extremity, or region or area. Archaically extrapolated, it could mean "army" or "war"; this meaning developed from the earlier meaning of "borderland" in a manner analogous to the French word campagne. The term is equal to German Mark and French marche. In other Slavic languages (including the Chakavian and Kajkavian dialects of Serbo-Croatian), the term has other meanings, either a territorial name (cf. Krajna in Poland, from Old Polish kraina, meaning region, borderland, extremity) or word with meaning "a land, landscape" (e.g. in Polish, Slovak, Czech or Sorbian). Cazinska Krajina, borderland of Bosnia towards Croatia around the city of Cazin. Today it is considered as Una-Sana Canton. Skadarska Krajina, region north from Bar and Ulcinj, across the mountain. It borders Skadar Lake on its northern edge. SAO Kninska Krajina, Kninska Krajina since the Yugoslav wars is used by some to signify two regions Knin and its surroundings, and to a larger extent Krajina proper (referring to main portion of Republic of Serb Krajina). 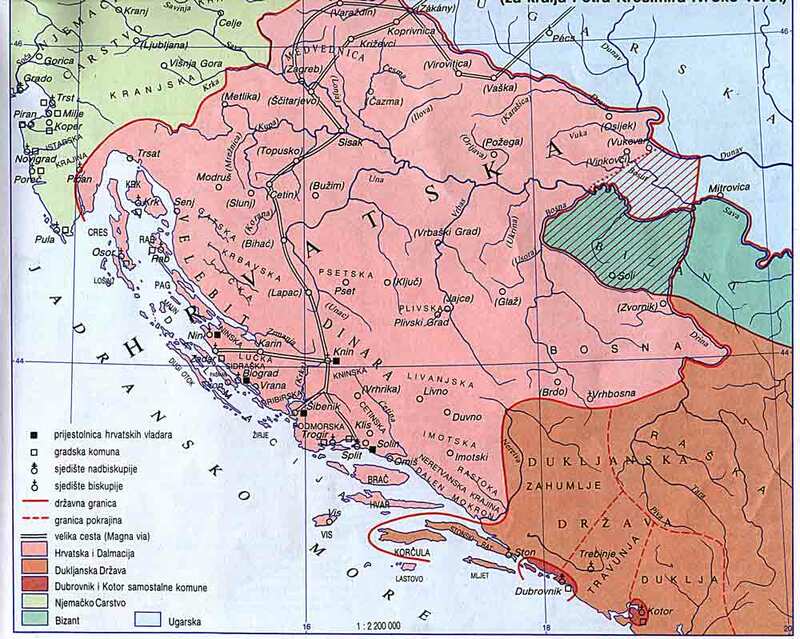 Where the term "Serbian Krajina" or "Krajina" alone is used, it most often refers to the former Republic of Serbian Krajina. In Ukrainian, krajina (країна) means "country, land", while Ukrajina is the country name. See also: Name of Ukraine. ^ a b Group of authors (1969). "Кра̏јина". Речник српскохрватскога књижевног језика, vol. 3 (in Serbo-Croatian). Novi Sad/Zagreb: Matica srpska/Matica hrvatska. p. 30. ^ Group of authors (1972). "Krajina". In colonel-general Nikola Gažević. Vojna enciklopedija, vol. 4 (in Serbo-Croatian). Belgrade. p. 681. This page was last edited on 24 January 2019, at 19:29 (UTC).